3D modeling has added great capability to the study of archaeology. 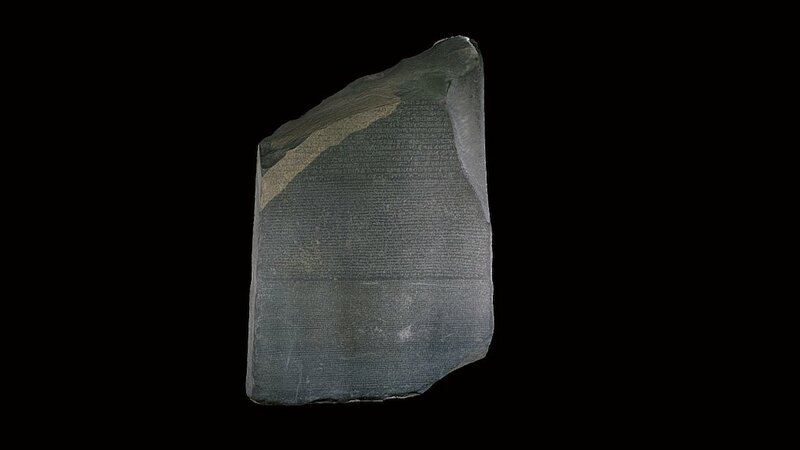 The Rosetta Stone, one of the great pieces in the British Museum, is now available in 3D. Part of grey and pink granodiorite stela bearing priestly decree concerning Ptolemy V in three blocks of text: Hieroglyphic (14 lines), Demotic (32 lines) and Greek (54 lines). The inscription is a decree passed by a council of priests, one of a series that affirm the royal cult of the 13 year-old Ptolemy V on the first anniversary of his coronation.Dating to 196 BCFindspot: Fort Saint Julien, El-Rashid, Egypt Length: 112.3 centimetres (max) Width: 75.7 centimetres Thickness: 28.4 centimetresCOL: YCA62958Model by Daniel Pett, 228 photographs taken with Nikon D5100, Sony A6000 and OnePlus3 mobile phone. This can be improved further with more photography in future.The sound description featured on this comes from our audio described tour.